06.09.2011. Friedhelm Loh had a big surprise in store for a group of cyclists raising money for charity. They were expecting a donation of 5,000 euros, but when the Menschen für Kinder e.V. charity bike ride stopped off at Rittal, the group's owner handed over ten times that amount. The organisation will use the 50,000 euro donation to help children with cancer. On Saturday, Menschen für Kinder e.V. held its fifteenth charity bike ride to raise funds for children with cancer. The route followed by the group of more than 500 cyclists was over 100 kilometres long and included a stop at Rittal in Herborn, where owner and Chairman Friedhelm Loh handed over a cheque for 50,000 euros to the organisers. To mark Rittal's 50th anniversary, he had spontaneously decided to donate ten times the amount originally announced. "Rittal turns 50 this year – and that is reason to be grateful", said Loh to the cyclists and their support team, who were given fruit and drinks at Rittal. "Being successful puts you in a position to help others. Rittal has enjoyed more than 50 years of success and I am genuinely delighted that this enables me to support your vital work and help the children. To mark our 50th anniversary, I am therefore adding another zero to the donation of 5,000 euros originally announced", he continued. The cyclists were suitably impressed and thanked Loh with an enthusiastic round of applause and a spontaneous Mexican wave. "This fantastically generous donation will greatly assist our work. The children will be grateful to you", said a visibly moved Volker Zimmerschied, First Chairman of Mensch für Kinder e.V. Every year, Menschen für Kinder e.V. 's big charity bike ride raises money to help children with cancer. The organisation supports children suffering from both cancer and leukaemia. It also provides funds for research projects at hospitals and clinics throughout Germany. 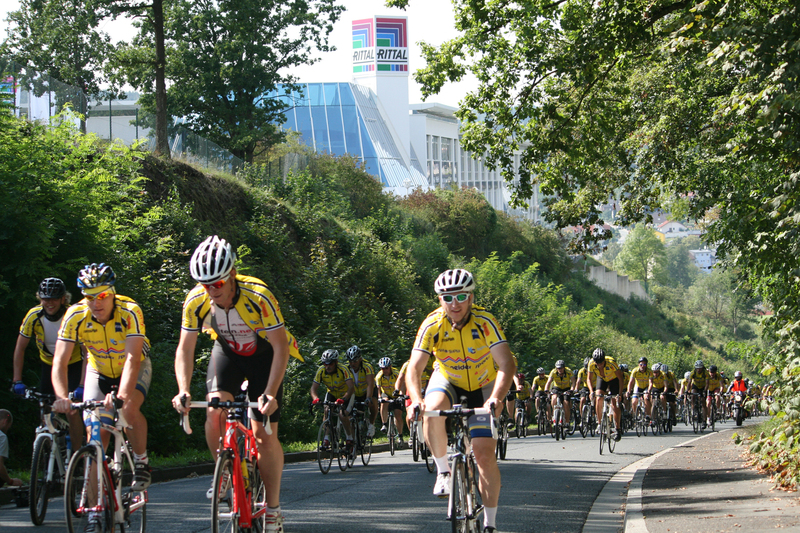 This year's bike ride raised a total of just under 167,000 euros. The cyclists faced quite a climb to stop off at Rittal, high up on Herborn's Stützelberg, on what turned out to be a hot Saturday morning. "I just took it as it came", said extreme sports athlete Joey Kelly, one of the prominent fundraisers, with a smile. "What I find far more impressive is the commitment of Rittal staff and Mr. Loh. I have been part of the fundraising campaigns for Haiti, Japan and now East Africa", continued Kelly in reference to earlier and current campaigns at Rittal. "And now Mr. Loh is donating another 50,000 euros to Menschen für Kinder. That's amazing! It really is commendable", he stressed. To the delight of the fundraisers, Friedlich Loh spontaneously multiplied his donation to Menschen für Kinder e.V. by ten, handing over 50,000 euros to mark Rittal's 50th anniversary. "If you want to get to the top, you have to make an effort – we at Rittal know that", said Friedhelm Loh to the 500 cyclists who had completed the steep climb to the top of the Stützelberg.